Venetian citizens insist: Get those massive cruise ships out of the Bacino. We are a large group of Venice residents and sympathizers from all over the world who are concerned about the fate of Venice. In recent weeks we have focused our attention on the problem of the negative impact and intensifying traffic of large ships — 610 mega-cruiseships in 2010 — that travel across the unique ecosystem of the Venetian Lagoon and pass just a few metres from Piazza San Marco along a canal that flows through the heart of the precious city. On 28 April 2011 we sent a letter to the relevant administrations and local authorities, setting out a series of important issues regarding this type of traffic such as air and noise pollution; the hydrodynamic underwater effects that affect buildings especially in proximity to the smaller lateral canals; the opportunity cost to the city of this additional tourism induced pressure in economic, social, environmental and cultural terms. In more than two months, not a single one of the eight institutions that received our letter has replied. The Cultural Minister, Giancarlo Galan, president of the Veneto Region for many years, superficially reduced the serious issues raised as a collection of questionable and subjective claims based on merely aesthetic criteria. 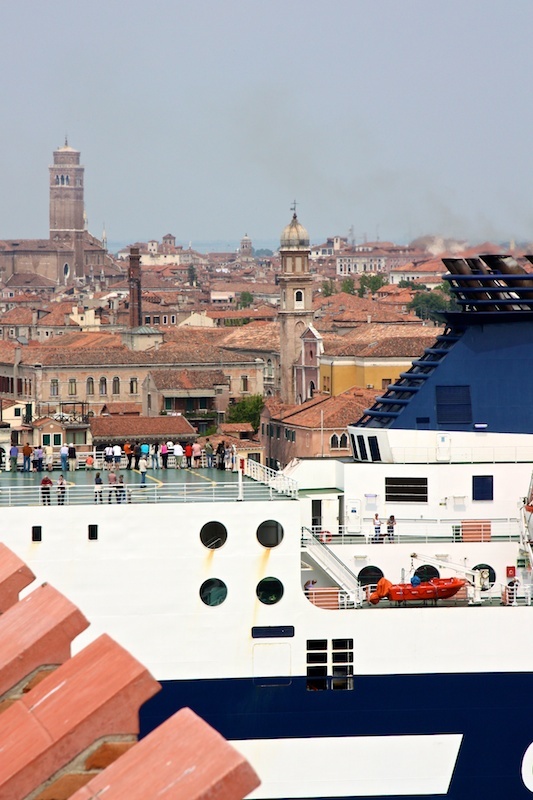 While he was the Mayor of Venice, the current President of the Port Authority, Paolo Costa had highlighted the need to re-route cruise traffic further away from the delicate city centre, but has not yet followed through with a commitment since taking on the Port role. The current Mayor, Giorgio Orsoni, has also spoken out against the presence of these big ships in the lagoon on several occasions. But he too has not yet taken a clear stance now that the citizens he represents have asked him to. Italia Nostra – Venezia* recently launched an appeal to the United Nations (Unesco) regarding the poor management of Venice. A quick scan of the main foreign websites covering Venice also reveals the high level of concern overshadowing our future. Yet it doesn’t seem as though this concern is shared with those who – above all – should make the destiny of the city and its residents their priority. We created a Facebook group to collect followers, ideas, suggestions and open a broad debate on this subject in order to inform thinking about a more sustainable future for Venice and the Lagoon. This spontaneous initiative is underwritten by a varied and representative range of political parties, residents associations, pressure groups, local businesses, celebrities as well as single individuals with a shared focus. We demand some attention: we have concrete proposals that would safeguard tourism and commercial interests as well as guaranteeing an acceptable quality of life for the Venetians, and without compromising the heritage of the city given the environmental impacts and risk factors associated with the passage of the ships through its heart. We ask for clear responses to these proposals and a clear stance by the relevant public authorities and administrations. There is no time left for just words. If no response is forthcoming, we will not hesitate in going further to confront the city’s administrators and those responsible for deciding port activities in other contexts such as the international organisations overseeing issues like public health, environmental protection, art, culture and heritage preservation, and are best positioned to provide a balanced and objective evaluation of the state of the city and future trends. The whole world should be exposed to what is happening in Venice. There is an urgent need to clarify who is responsible for damaging it, who is not, and who is keeping the silence. Venetians want to know. Venetians want to know — along with a lot of other folks. Not sure what they’ll be able to do however, as they’ve just opened a new passenger terminal at Port Isonzo, and Paolo Costa has come up with a grand solution of a one-way passage, “like New York,” that of course would involved digging a whole new canal from the Marittima to Fusina. * remember you can translate (kinda) any page instantly using the Google Chrome browser, or going to translate.google.com and copy/pasting text. This entry was posted in About Venice, Vita Venexiàn on July 14, 2011 by Living Venice. I was shocked to see such huge ships travel through the lagoon. I personally am not a big supporter of Cruises but they work for people who are older and want to see more within a specific time frame or even large families. When Anthony Bourdain went to Venice the locals explained that they don’t dislike all tourists, just the cruise ship tourists who get off for a couple of hours, walk around and feel as if they have seen something of their city. It is definitely a different way to travel where you miss out on a lot. I stayed in Venice for about a total of 2 weeks and it wasn’t long enough. I feel as though it is an extremely precious and historic location of the world that needs protection and care- I imagine the actual citizens of Venice feel the same but much more deeply than an outsider. I visited in January, an off season time. I consider myself fortunate in that I was able to live in Venice a short time while taking a Master Class at the Orsoni School, without the intrusion of cruise ships. Clearly clogging the view and the unique Venice experience. I’ll remember the day to day life in Venice rather than a misplaced cruise ship blocking the view. Even when we’re in Venice in November and December the number of huge cruise ships appall me – so goodness knows what it’s like in mid-summer. Quite honestly they terrify me – they are so close to the fondamentas that just one minor mechanical problem or small lack of attention by the pilot could have devastating consequences (unfortunately that might be what it takes for the decision makers to actually do something). The vibrations they cause (which you can feel as they go past) can only be causing significant damage. thanks for posting about this Nan. Beautiful comments. I took the liberty of inserting them, original English and Italian translation, in the website of the association I belong to (Italia Nostra, Venice Chapter), as an example of the reaction of non-venetians concerned about the present and the future of the city. Thank you for posting them! Quite simply, an abomination and a blight on the horizon. We saw one of these moving along the water during our last visit – so jarring to the senses. But then I live in New York City, which is a big cruise line port, and I have also spent a lot of time in Miami, another popular port for cruises. While cruises are not my preferable means for travelling, a lot of people enjoy them, not just old people. I suppose I would support measures to keep the cruises from getting too close to the island and causing any damage. But I think it would be a great shame if Venice was removed from the list of great ports that welcome cruise lines and their customers! Thanks for your comments, Karl. You highlight a good point: no one is interested in ‘getting rid of’ the ships — just managing the excessive traffic and damage they do. Think of moving the port of New York or Miami to the Hamptons, and how long before the area and the ecosystem would be overwhelmed? I think these citizens are only lobbying for responsible management — they’d like the city to be well-maintained both for locals and visitors to enjoy for many years to come, no matter how they arrive. I think if cruise companies knew their passengers wanted them to behave responsibly — and if destinations would make responsible demands of their visitors, it could only to make cruising more enjoyable for everyone, including the traveler. I recently visited Venice a month back and absolutely adore the place! I completely understand why local citizens are mighty cheesed off by these colossus cruise liners ploughing through such a delicate water wonderland. They dwarf everything in sight, disrupt locals and tourists enjoying or commuting across the waters, and I even saw a few visitors of those cruise ships drop litter into the water before my very eyes – it is disgusting! A lot of those people were desperately waving from the ship, but I don’t think anyone in Venice were waving back… probably sick of the sight of them.